Left to right: Vanessa Duren-Robinson, Ph.D. (Editorial Board Member); Elijah Onsomu (Managing Editor and Layout Editor); Peggy Valentine, Ed.D. (Editor-in-Chief); Steve Aragon, Ph.D. (Editorial Board Member); and LaKisha Crews (Assistant to Acting Managing Editor). Not pictured: Joanne Banks (Associate Editor) and Leslie Allison, Ph.D. (Editorial Board Member). 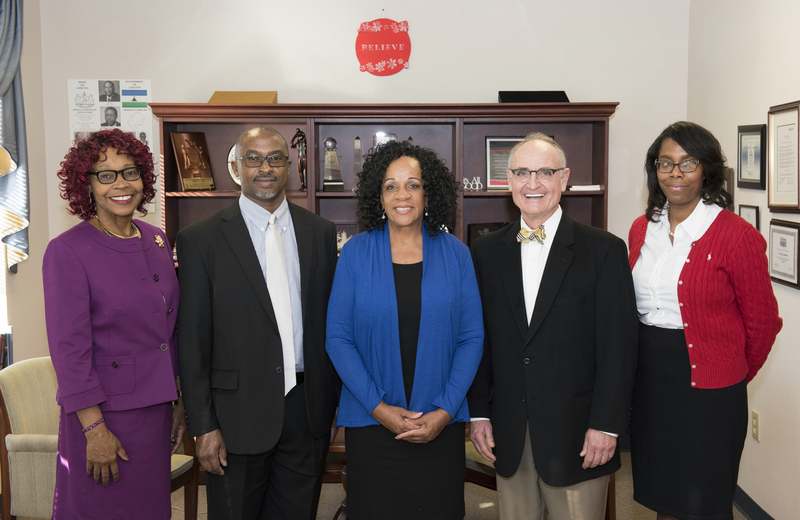 Photo courtesy of Winston-Salem State University. In the following interview, John McLeod, director of the UNC Press Office of Scholarly Publishing Services discusses the Journal of Best Practices in Health Professions Diversity: Research, Education and Policy with editor-in-chief Dr. Peggy Valentine. Dr. Valentine is dean and professor at the School of Health Sciences at Winston-Salem State University, a constituent of the University of North Carolina system. She founded the peer reviewed Journal of Best Practices in Health Professions Diversity: Research, Education and Policy (J Best Pract Health Prof Divers) in 2007 to provide a forum for the discussion of factors that promote or constrain the development and sustainability of a diverse health professions workforce. Dr. Valentine oversees Winston-Salem State University educational programs in Clinical Laboratory Science, Exercise Physiology, Healthcare Management, Nursing, Occupational Therapy, Physical Therapy, and Rehabilitation Counseling. She has clinical experience as a registered nurse and physician assistant and has conducted research on homeless and minority issues. She is actively engaged with a number of state and national groups and institutions including the board of trustees for Novant Health Medical Group, the Department of Health and Human Services Advisory Committee on Community-Based Interdisciplinary Linkages, the Consortium on International Management Policy and Development, the Association of Schools of Allied Health Professions, and the National Society of Allied Health. John McLeod: Can you tell us why you started the journal? Dr. Peggy Valentine: I was inspired by the 2004 Sullivan Commission’s Report on “Missing Persons in the Health Professions,” and felt the need to provide a forum for educators, researchers and others to share their research, experiences in their programs, and offer potential solutions. JM: What do you see as some of the biggest challenges and opportunities the healthcare professions face today in terms of achieving better diversity? PV: The greatest challenge in achieving diversity is knowledge. Diverse students are often unaware of the variety of health disciplines and the educational requirements to be competitive. Many are unaware of available resources and lack mentors who can point them in the right direction.A challenge exists for faculty and administrators of educational programs who may also lack knowledge on how to best recruit and retain diverse students. Finally, the health care industry is challenged in recruiting diverse employees. It has been my observation that organizations with set goals and strategies in place to achieve a diverse workforce are more successful, especially when diversity is a high priority at all levels, including upper levels of management. JM: You recently formed a partnership with the National Association of Medical Minority Educators which now offers the journal as a member benefit. Tell us a little bit about the NAMME and their mission. PV: Our partnership with NAMME is a win-win for both of us. As a national organization, NAMME works to ensure racial and ethnic diversity in all health professions and seeks to provide guidance and professional development opportunities for those individuals dedicated to diversity. Through the journal, we are able to enhance the organization’s mission as a vehicle to publish and disseminate their work to a wider audience in support of a more inclusive culture. JM: The Journal is also closely aligned with the NC Alliance for Health Professions Diversity (NCAHPD), which is part of the Sullivan Alliance to Transform the Health Professions. Can you tell us about the relationship between the NCAHPD and the journal? PV: The journal was launched in 2007 and plans were in place shortly thereafter to hold a statewide conference on health professions diversity. After learning that the North Carolina Area Health Education Center (NCAHEC) was planning a similar conference, we decided to work together. Through this partnership, the NCAHPD was co-founded by both groups in 2008 with the implementation of the first statewide conference on Health Professions Diversity. We invited participants from health care institutions around the state who were all interested in improving diversity. Today, NCAHPD is a statewide organization that seeks to improve diversity of the health professions through strategic and collaborative partnerships. There are over 20 institutions of higher learning, health agencies, and other organizations desiring a diverse representation of health professionals statewide. A biennial statewide conference is held, the most recent of which was March 22-24, 2017, at the Grandover Hotel in Greensboro. The Journal publishes the conference proceedings and disseminates copies to registered conference participants as well. JM: How do you see the journal advancing research and teaching at Winston-Salem State University (WSSU)? PV: An important goal of any institution of higher learning is to advance the body of knowledge through research and scholarship. Given its important mission as a Historically Black College and University, WSSU was founded on principles of social justice, and promotes equity intentionally and comprehensively. A journal that addresses the need for a more diverse health professions workforce, therefore, is consistent with the university’s mission. This journal has provided an opportunity for faculty to serve as peer reviewers and to publish their research that undergoes the peer review process like any other submitted manuscript. The journal has also provided an opportunity for graduate students to gain experience in working with authors from around the nation, to market the journal to potential subscribers, and to solicit articles for publication. JM: Have there been any articles from past issues that seemed to particularly resonate with your audience? PV: There have been a number of articles of interest. One particular article was written by Joseph Betancourt and others in the Spring 2013 issue, “Improving Quality, Achieving Equity, and Increasing Diversity in Health Care: The Future is Now.” The article listed some root causes of disparities and steps that need to be taken to achieve diversity, including a review of admissions practices, the importance of leadership, and accountability to bring about change. The piece that resonated was the call for minority faculty and students to become activists around the topic of diversity. Over the years we have received notable articles around the issue of diversity and best practices in programs and industry. JM: What are some topics that you hope the journal will explore in the future? PV: With all of the changes that we are seeing in higher education and the proposed scrapping of the Affordable Care Act, otherwise known as Obamacare, it would be great to see some articles on implications for health professions diversity. We welcome articles on innovative strategies that promote success among diverse students, successful models for recruiting and retaining diverse students, faculty essays on diverse students overcoming obstacles and resilience in the health professions and health-related issues affecting underrepresented minorities at their respective work places. More information about the Journal of Best Practices in Health Professions Diversity is available at the Winston-Salem State University website. To subscribe to the journal, visit the UNC Press website.